The Super-K collaboration has (finally!) published our paper (M. Litos et al., Phys. Rev. Lett. 112, 131803) based on Mike Litos’ Ph.D. thesis search for dinucleon decay into kaons. This process changes baryon number by two units without any change in lepton number, and therefore is sensitive to very different underlying physics than most nucleon decay searches. This particular mode is allowed in supersymmetric models that have R-symmetry violation. 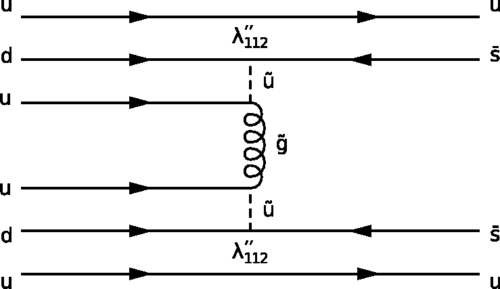 A possible Feynman diagram is shown below. This is the first ever search for a baryon number violating process that also changes strangeness by two units. 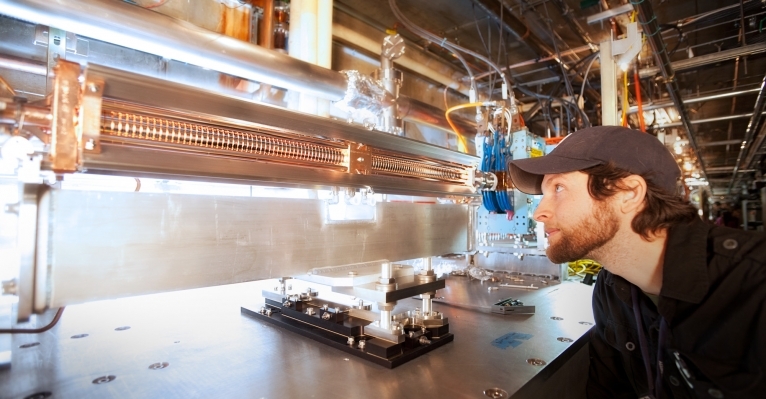 Mike is now a postdoctoral scientist at SLAC working on plasma wakefield acceleration. Here is a photo of Mike working on the Facility for Advanced Accelerator Experimental Tests that was featured as one of the 12 Most Awesome of 2012! 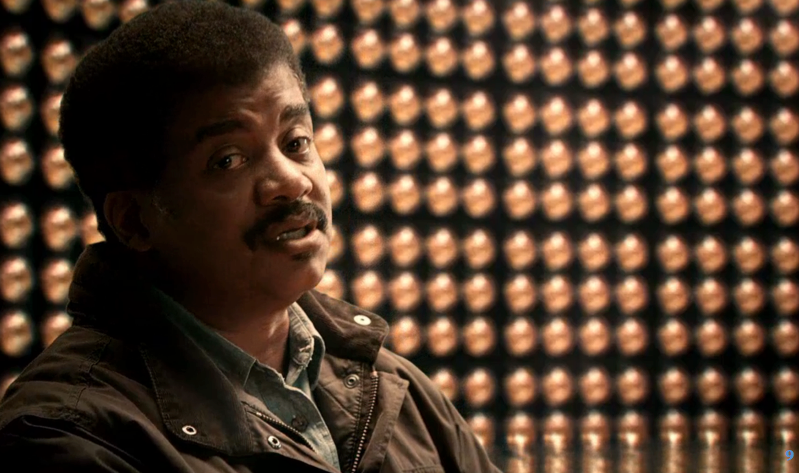 Neil deGrasse Tyson paid a virtual visit to the Super-K detector to discuss supernova neutrinos. The vignette appeared in the April 13 episode of COSMOS, “Deeper, Deeper, Deeper, Still”, Episode 6.
has been selected as a Physical Review Letters Editors Suggestion as well as Featured in Physics. It is also being reviewed by articles in Physics Today, Physics World (UK) and Physics Focus by the APS. Our most recent T2K publication (Phys. Rev. Lett. 112, 061802) shows the electron neutrino appearance signal interpreted in comparison with the measurements of electron antineutrino disappearance by the reactor experiments. The paper was featured in a PRL Viewpoint article discussing how these results are first steps along the path towards observing CP violation in neutrinos. The T2K collaboration is releasing the latest results on electron neutrino appearance, starting with the European Physical Society meeting today. This includes 2013 data taking at 220 kW and a world-record 1.2e14 protons-per-pulse. In the new data we found 28 single-ring quasi-elastic electron neutrino candidates over an expected background of 4.6 events from the trace of electron neutrinos in the beam and mistaken neutral current interactions. For the value of θ13 from reactor experiments we expected about 20 events, so our expected significance is greater than 5 sigma. These recent results clearly establish the phenomenon of electron neutrino appearance in neutrino oscillations. The figure below shows the distribution of electron neutrino energies for the 28 events. The T2K collaboration accompanied this new report with a press release that can be found here: http://t2k-experiment.org/2013/07/new-results-from-t2k-conclusively-show-muon-neutrinos-transform-to-electron-neutrinos/. The T2K collaboration restarted data taking in early 2012 after recovery efforts from the Great Japan Earthquake of 2011 were completed at J-PARC. We collected an additional 1.6e20 protons on target, somewhat more than doubling the 2011 data set. We now have 11 candidate events for electron neutrino appearance, compared to an expected background rate of 3.22 +- 0.43. An oscillation analysis results in a best fit to sin2 2θ13 of 0.094 +0.053 -0.040. 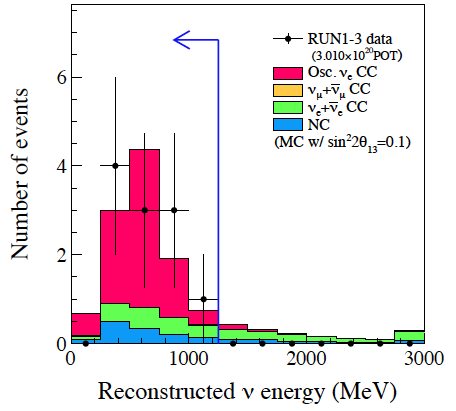 This result is updated from Neutrino 2012 in Kyoto and was presented at ICHEP 2012 in Melbourne Australia. 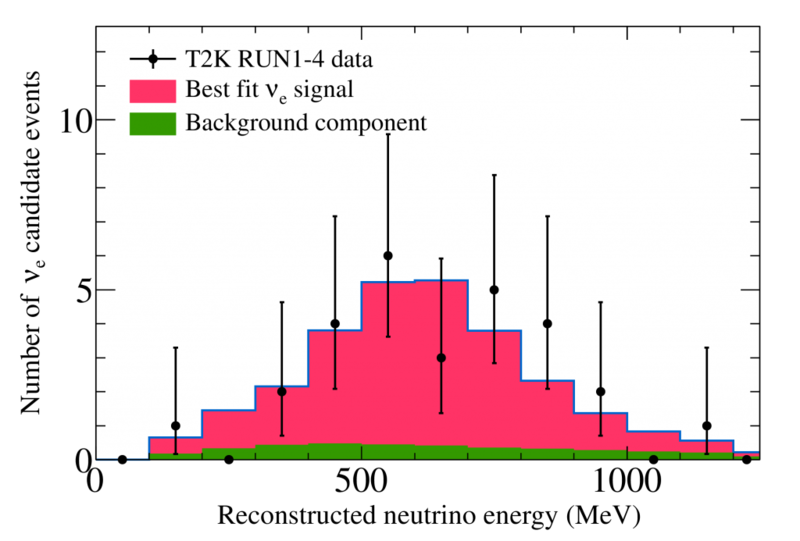 T2K electron neutrino appearance spectrum for 3e20 POT as presented at ICHEP Melbourne 2012. The T2K collaboration has submitted our first physics paper to Physical Review Letters. In it we report the most significant evidence to date that muon neutrinos transform into electron neutrinos. This transformation is governed by a previously unmeasured parameter of nature (called θ13 “theta one three”). In this paper we report the detection of six electron neutrino events in a carefully controlled beam that should have at most 1.5 electron neutrino events. The probability that we observe as many as six by chance is less than one percent. The publication of this result is accompanied by a press release from the Japanese laboratories and a seminar at KEK. 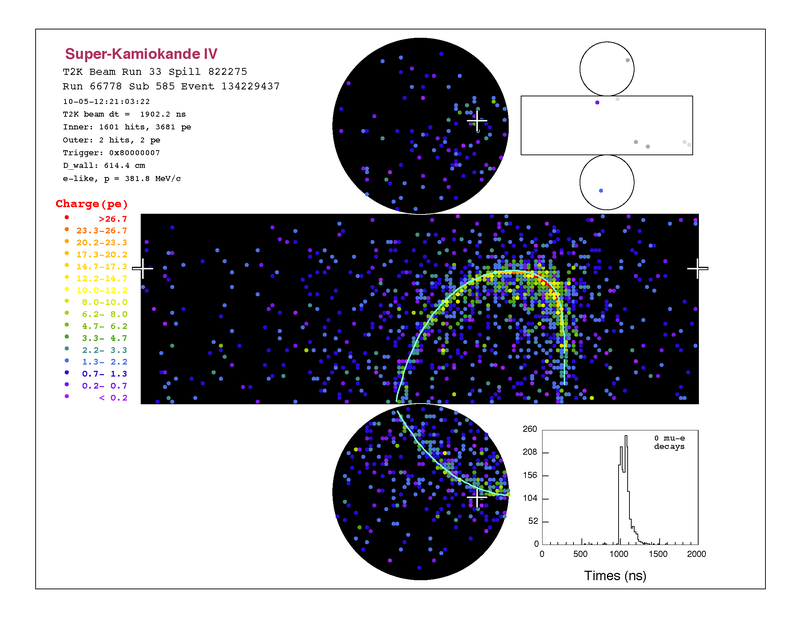 A graphical event display of one of the six electron neutrino events recorded by the Super-Kamiokande detector. The numerous colored circles represent which of the 11,100 photomultiplier tubes was struck by cherenkov light. 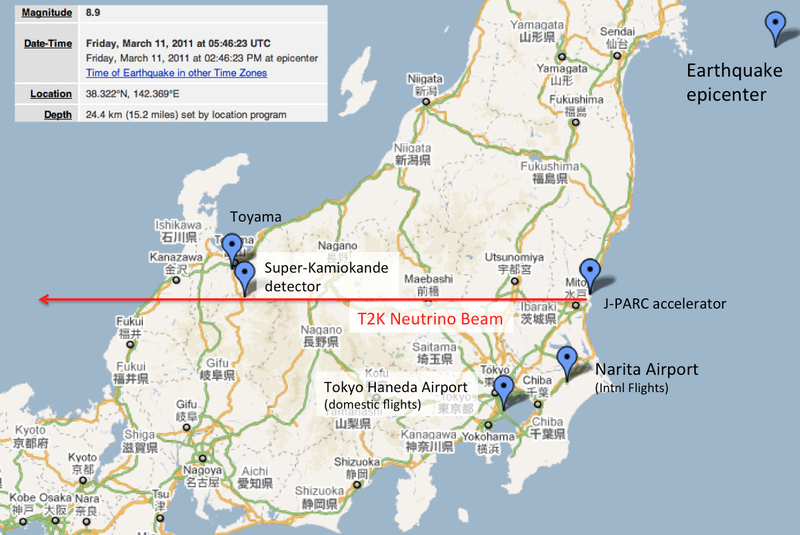 Map of Japan showing the T2K neutrino beam. The T2K experiment sends a beam of neutrinos produced at the J-PARC accelerator on the east coast of Japan 295 kilometers (through the earth’s crust) to the Super-Kamiokande detector in the Kamioka mine on the west side of Japan. The beam is actually mis-aimed slightly, a trick known as the “off-axis technique”, to select neutrinos of a specific energy. The energy is precisely tuned to match the neutrino oscillation effect discovered by Super-Kamiokande in 1998 using neutrinos from cosmic rays. When the beam arrives at Super-Kamiokande, the neutrino oscillation effect is maximized and most of the muon neutrinos disappear. However, if the θ13 parameter is not zero (from prior experiments we already know it is small), we can detect a few muon neutrinos turning into electron neutrinos. Based on these six events we can say with modest confidence that θ13 is greater than zero, but it is not statistically certain enough to claim a discovery. Testing custom ethernet cards at B.U. Mike Litos, undergraduate Brian Henning, and Jen Raaf. Boston University has been involved in the Japan physics program since 1991. We helped construct the original Super-Kamiokande detector, with major responsibility for the outer detector. Our group has graduated seven Ph.D.s and provided research opportunities for a number of undergraduates. Our most recent effort, with the help of the B.U. Electronics Design Facility, was to build custom ethernet readout cards for the 2008 Super-Kamiokande electronics upgrade, which completely replaced the the electronics and data acquisition for the detector in time for the T2K phase of operation. Boston University authors on this first paper include graduate student Mike Litos, research associate Jen Raaf, and Profs. Ed Kearns, Jim Stone, and Larry Sulak. Our research efforts are supported by the Department of Energy Office of Science. Measuring the θ13 parameter is the major objective of numerous experiments world-wide. Several experiments use nuclear reactors as a source of electron neutrinos: the Double Chooz experiment in France, the Daya Bay experiment in China, and the RENO experiment in Korea. In the U.S. there are accelerator-based experiments that use a neutrino beam from Fermilab to Minnesota. The MINOS experiment, designed for other purposes, is also searching for electron neutrino appearance. The NOvA experiment will use the off-axis technique with a new detector under construction. Boston University neutrino group alumnus Mark Messier, now a professor at Indiana, is the co-spokesperson of NOvA. Alumnus Wei Wang is a research scientist at William and Mary, looking for θ13 with the Daya Bay reactor experiment. Alumna Fanny Dufour is a co-author on this T2K paper, but is now working as a research scientist at the Université de Genève, Switzerland. We continue to closely collaborate with our past research associates Chris Walter and Kate Scholberg, who run their own Super-K/T2K group at Duke University. Past research associate Alec Habig is a professor at University of Minnesota Duluth working on MINOS and NOvA. If the results from T2K and all of these experiments firmly establish that θ13 is not zero, then we have nearly completed our description of the neutrino sector of the standard model. If θ13 is large enough, this opens the door for a future generation of experiments to explore the remaining open questions, in particular, the difference between neutrinos and their antiparticles (antineutrinos). This difference in behavior is referred to as CP violation. It is of great theoretical interest to fully understand CP violation in the hopes of explaining why the observed universe is composed of matter and not equal parts of matter and antimatter. Future projects, such as the proposed Fermilab-Homestake Long Baseline Neutrino Oscillation Experiment (LBNE) will seek CP violation with neutrinos, but need a sizeable value of θ13 to proceed. Another possible project would use an upgraded J-PARC neutrino beam, still pointed towards Kamioka, but with a massive new detector called Hyper-Kamiokande. The T2K experiment started in January 2010 and was running smoothly until interrupted by the great Japan earthquake on March 11, 2011. The published result is based on all of the accumulated data through that date, but that represents only 2% of the planned exposure of the experiment. There was no damage to the Super-Kamiokande detector in west Japan, but the J-PARC accelerator complex experienced quite a bit of damage to infrastructure. Roads were buckled and pipes and connections were broken, but it seems so far that damage to accelerator components was minimal. It will take concerted effort to get the J-PARC complex back online; work is underway and we anticipate resuming the neutrino beam in late 2011. 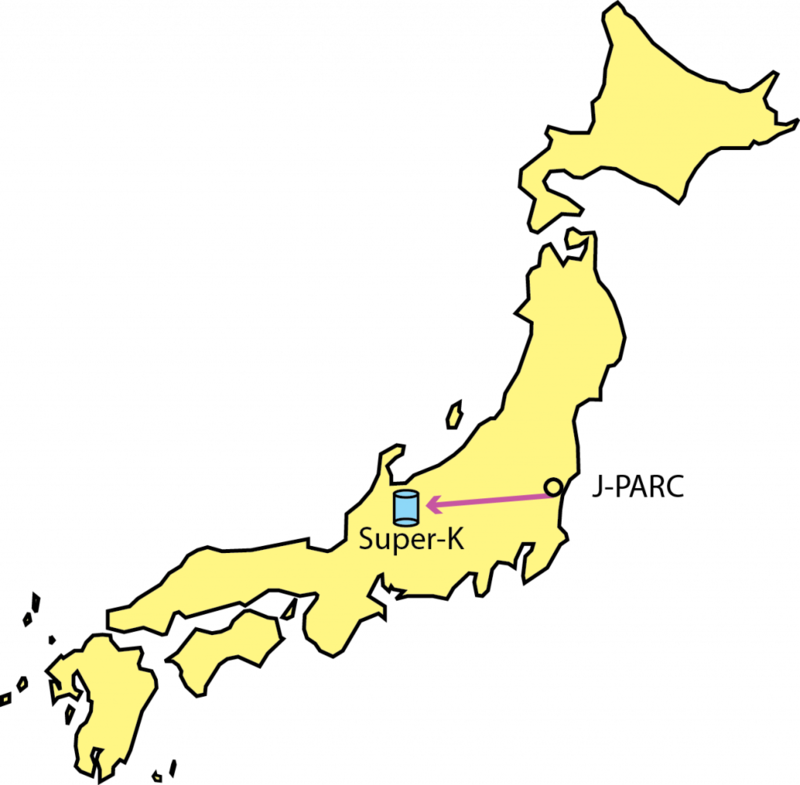 Relative locations of Super-K, J-PARC, and the epicenter of the 2011 earthquake.